If the item originates in the U.S. (indicated under “Shipping” on the item detail page) and your shipping destination is in the U.S., use the Item Price column below to determine your shipping cost. If the item originates in the U.S. (indicated under “Shipping” on the item detail page) and your shipping destination is outside of the U.S., use the Item Price column and your country’s shipping region, which is noted below the chart, to determine your shipping cost. If the item originates outside the U.S. (indicated under “Shipping” on the item detail page) and your shipping destination is within the U.S., use the Item Price column and the shipping region of the country of origin, which is noted below the chart, to determine your shipping cost. Items originating outside the U.S. (indicated under “Shipping on the item detail page) and shipping to destinations also outside the U.S. have variable shipping costs based on the origin and destination countries. To estimate the shipping cost of an item, add the desired item to your shopping cart and enter your shipping destination on your Cart page. If you have further questions, please contact Collector Services and we will do our best to assist you. Shipping costs include packaging, handling, and insurance fees. If your country is not listed here, please contact Collector Services, and we will do our best to assist you. How are taxes and duties calculated on my purchase? Shipping costs are determined based on the price, dimensions, and weight of the item purchased, as well as by the shipping destination and the object’s origin (the origin is indicated on the item detail page under “Shipping”). All packaging, handling, and insurance fees are included in the shipping cost. To estimate the shipping cost on your order, add the desired item(s) to your shopping cart and enter your shipping destination on your Cart page. You can also refer to the Shipping Rates Tables for an overview of shipping prices. 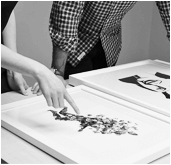 Artspace works with carriers including FedEx, DHL, and UPS, as well as several fine art handling companies. The carrier selected for your purchase is dependent on the item’s origin and shipping destination, as well as its packaging and handling requirements. Artspace ships to the following countries: Andorra, Argentina, Armenia, Australia, Austria, Bangladesh, Belgium, Belize, Bolivia, Brazil, Bulgaria, Cambodia, Canada, Chile, China, Colombia, Costa Rica, Croatia, Cyprus, Czech Republic, Denmark, Dominican Republic, Egypt, Finland, France, Germany, Greece, Grenada, Guam, Hong Kong SAR China, Hungary, Iceland, India, Ireland, Israel, Italy, Japan, Kenya, Kuwait, Latvia, Lebanon, Liechtenstein, Lithuania, Luxembourg, Macau SAR China, Malta, Mexico, Monaco, Morocco, Netherlands, New Zealand, Norway, Oman, Peru, Philippines, Poland, Portugal, Puerto Rico, Qatar, Romania, Russia, Saudi Arabia, Serbia, Singapore, Slovakia, Slovenia, South Africa, South Korea, Spain, Sweden, Switzerland, Taiwan, Thailand, Turkey, Ukraine, United Arab Emirates, United Kingdom, Venezuela, Yemen. If your country is not listed here, please contact Collector Services, and our team will assist you. When your order ships, you will receive a shipment confirmation email with a tracking number. You can check the status of your package and the estimated delivery date online by using the tracking number. If you order multiple items, they may be shipped and delivered separately. We cannot guarantee rush delivery at this time. However, if you are in need of expedited shipping, please contact Collector Services, and we will do our best to accommodate your request. Generally, multiple items cannot be combined into one shipment, either because the items are shipped from different locations or because the items must be packaged separately. If you have a specific question about shipping multiple items, please contact Collector Services.